While there are travel junkies who love to explore beaches and cities, there those who’d rather spend their well-deserved vacay by going on river cruises. Nothing beats spending your free days in the comfort of a luxurious ship boasting of world-class facilities and amenities that can rival those of five-star hotels and parks. Aqua Expeditions had been around for years offering luxury cruises on the world’s greatest rivers. It was launched in 2007 by Francesco Galli Zugaro, its founder and CEO who wanted nothing more than to bring his dream of travelling in comfort and luxury to life and allow other fellow adventurers to experience state of the art cruising in some of the world’s greatest rivers. Aqua Expeditions isn’t like other cruises out there. To start, we take pride in our obsession over the simplest details from the cotton count of the sheets you use down to the different treatments we offer at the spa to the ratio of staff to customers. Rest assured you are our main priority and your comfort and convenience is at the top of our list of priorities. It was in 2007 when Aqua Expeditions started to establish a name in the small ship luxury cruising. It launched Aria Amazon, a luxury cruise ship which started to set sail back in 2011. Through this one of a kind luxury ship, travelers were given the chance to explore the Amazon River’s Peruvian stretch. So what makes this river cruise stand out? To start it, offers an up close experience of everything you need to discover from the exotic wildlife of the great Amazon rainforest to its perfect natural beauty and wonder left untouched by civilization for years. Further, those on board can experience everything that Peru has to over without sacrificing comfort and luxury even while traveling. Guests are sure to enjoy and learn more about this very diverse country in the world. Peru is located in the northwest part of South America. It’s known for its very rich history and extraordinary culture and traditions. Most importantly, people are often left awestruck by its captivating natural beauty specifically that of the Amazon rainforest. This untouched rainforest comprises 60% of Peru’s national territory and is one of the main reasons why many local and international tourists flock here every year. Aside from the Amazon rainforest, there’s also the world famous Machu Pichu. This Inca ruins is known as the largest state during pre-Columbian America boasting of the Pampa Colorada and its Nazca Lines that until today remain a mystery. There are also the gigantic canyons of the Colca River and Lake Ticaca where one can still find natives untouched by industrialization and still living on floating islands composed mainly of reeds. It’s only in Peru where Pacific beaches and desert areas and the towering Andes Mountains meet to provide adventurers out there the chance to be closer to nature. One will never be disappointed with the beauty that awaits in this must-visit destinations. Perhaps you’re wondering what else await you in Peru? Aria Amazon ensures you get to see all the local attractions in this majestic country. Peru has a lot to offer visitors particularly those who go on luxury river cruises. Prepare to be awed by the picturesque landscape with its haciendas and elegant old churches built by the Spaniards themselves. They were the ones who conquered Peru and left behind their culture and traditions during the process. You will be delighted by the small villages with their hospitable residents. They also have outdoor markets where many indigenous women dressed in their colorful clothes and bowler hats would gather round to talk or trade. Your trip won’t be complete without visiting Lima, its capital city home to the famous cultural center which was opened by Mario Testino, a world acclaimed photographer known mostly for his photographs of Princess Diana. In case you get hungry, rest assured there are many restaurants where you can satisfy your tummy. You can buy food in the market especially if you prefer to try their native delicacies. There are also several restaurants in case you’re one of those picky eaters who prefer to stick to the kind of food you usually eat. 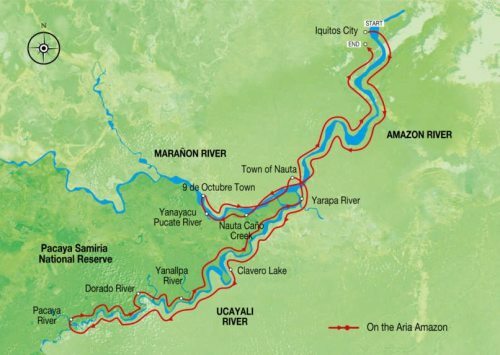 Aria Amazon is one of the best luxury cruise ships in the world and your top choice when exploring the Amazon. If you want to get the most out of your vacation, better visit during summer when everything is greener. Rainy season limits your time outdoors and prevent you from exploring the rainforest as well as other destinations in Peru. One of the most in demand cruises Aqua Expeditions offers involved exploring the Cambodia, Vietnam and The Mekong in the luxurious Aqua Mekong. 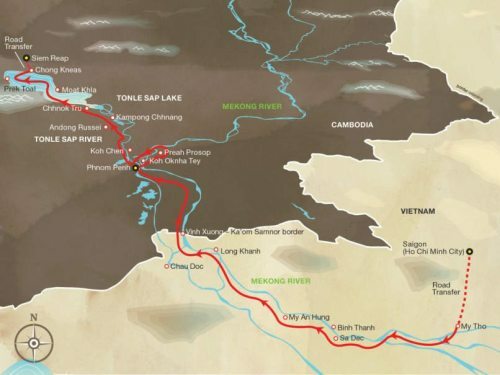 Allow us to take you to your destination of a lifetime in these very rich countries found in Southeast Asia by sailing up and down the famous Mekong River on board one of our best ships. We guarantee you that spending your vacay with us will go down in your travel history as one of the most unforgettable and worthwhile experiences ever. Vietnam and Cambodia are neighbors that share unique cultures, beliefs and traditions as well as boasting of varied tourist destinations ranging from historic landmarks to world heritage sites you should see. Cambodia has always been one of the most visited countries in the world thanks to UNESCO World Heritage Site known as the Khmer temples of Angkor Wat. Explore the ruins of these temples that speak of a special kind of architecture and share the country’s very rich history. On the other hand, if you prefer going to the beach, there’s Sihanoukville where you can enjoy a dip. Vietnam is another destination many tourists flock to every year. It’s known for its languid hills located in Dalat and of course, there’s the modern city of Saigon or Ho Chi Minh City where you can enjoy everything an industrialized city has to offer from world class restaurants and shopping centers to museums and local landmarks. If you love beaches, go snorkeling in the famous China Beach where you can swim and dive with all kinds of marine life. Technically, you can enjoy cruising on the Mekong River onboard Aqua Mekong anytime of the year. Even with heavy rainfall, the river remains calm and comfortable for travel. However, you can make the most out of your excursion by cruising during dry season specifically from November to February. April and May are the months of the year when it’s hottest in Vietnam and Cambodia, nonetheless we assure guests a luxurious stay on Aqua Mekong. We’ve years of experience under our belt in the luxury cruise ship industry. We take pride in our state of the art services. We offer nothing but the bets to our customers. Aria Amazon and Aqua Mekong are two of our very special cruise ships that take tourists to some of the best destinations in the world. During your cruise, we treat you more than just guests but family too. We guarantee to provide you the comfort and convenience you need to enjoy every second of your trip. More and more tourists are now considering luxury cruising when traveling. If you want to have fun and enjoy without going beyond your budget, one of the first things you should do is to book with us ahead of time. Don’t hesitate to give us a call even months before your travel period. You can make reservations earlier so you get to choose the rooms you want to stay in and even avail of our special deals and offers. It will also help a lot if you book your flight earlier too to avoid problems. Another practical tip is to travel light. Before you go on board our cruise ships, assess the kind of weather the country has at the moment. If you’re traveling during dry season or summer, bring light pieces of clothing with you. On the other hand, bring a coat or thicker clothes with you when you intend to travel during rainy season. Most importantly, wear comfortable shoes. You’re there to explore and have fun so don’t use footwear that will prevent you from doing so. Our cruise ships are equipped with modern facilities and amenities so be sure to enjoy them. Don’t confine yourself within the four corners of your room, instead mingle and meet new friends. Have a taste of our special menu or take a break in our spa. If you need anything, there’s always someone to assist you with your needs. If you want to go on a river cruise on your next vacation, be sure to contact Aqua Expeditions. We are here to help arrange your most unforgettable, fun and exciting river cruise! Call us today!